Apple Inc. announces new products, product redesigns and upgrades through press conferences that garner a significant following in traditional and online media. Often the purpose of the event is kept as a secret to create buzz and only unveiled during the event. These events are usually streamed live on Apple's website. After a basic market update, Jobs announced that Apple would transition the Macintosh platform to Intel x86 processors. The keynote featured developers from Wolfram Research, who discussed their experience porting Mathematica to Mac OS X on the Intel platform. The conference consisted of 110 lab sessions and 95 presentation sessions, while more than 500 Apple engineers were on site alongside 3,800 attendees from 45 countries. The band The Wallflowers played at the Apple campus. At the Macworld Expo on January 9, 2007, Jobs announced that Apple Computer, Inc. would from that point on be known as Apple Inc., because computers were no longer the main focus of the company, which had shifted its emphasis to mobile electronic devices. The event also saw the announcement of the iPhone and the Apple TV. The following day, Apple shares hit $97.80, an all-time high at that point. In May, Apple's share price passed the $100 mark. Announcements at the keynote included the App Store for iPhone and iPod Touch, the stable version of the iPhone SDK, a subsidized 3G version of the iPhone for Worldwide markets, version 2.0 of iPhone OS, Mac OS X Snow Leopard (10.6), and the replacement/rebranding of .Mac as MobileMe. Announcements at the keynote included the release of the iPhone OS 3.0 software announced to developers in March, a demonstration of Mac OS X Snow Leopard (10.6), the new 13" MacBook Pro, updates to the 15" and 17" MacBook Pros, and the new iPhone 3GS. The iPad was announced on January 27, 2010, by Steve Jobs at an Apple press conference at the Yerba Buena Center for the Arts in San Francisco. Jobs later said that Apple began developing the iPad before the iPhone, but temporarily shelved the effort upon realizing that its ideas would work just as well in a mobile phone. The iPad's internal codename was K48, which was revealed in the court case surrounding leaking of iPad information before launch. On June 7, 2010, Jobs announced the iPhone 4. Also, iPhone OS was renamed to iOS. The FaceTime and iMovie app for iPhone applications were also announced. Apple sent invitations to journalists on February 23, 2011, for a media event on March 2. Apple CEO Steve Jobs revealed the iPad 2 device at the Yerba Buena Center for the Arts on March 2, 2011, despite being on medical leave. Apple unveiled Mac OS X Lion, iOS 5, the cloud service iCloud and iTunes Match. This keynote was not streamed live. On October 4, 2011, Apple held a media event in which it introduced Find My Friends, refreshed the iPod Nano and iPod touch, and revealed the iPhone 4s with its all-new Siri voice assistant. The keynote began 10 AM PST (18:00 UTC) with Cook introducing iOS 5.1, a Japanese version of Siri, and the 3rd generation Apple TV before the 3rd generation iPad. Eddy Cue gave a demo of the new Apple TV interface. At the media event, Cook talked about a 'post-PC world', a world where the personal computer is no longer the center of one's digital life, and of how the 3rd generation iPad will be one of the main contributors of the 'post-PC world'. This keynote was streamed live exclusively on iOS devices and OS X, through Safari on June 11, 2012. It’s the thinnest and lightest iPhone, at 7.6mm thin, and 112 grams. Schiller said those measurements make it the world’s thinnest smartphone. The iPhone 5 was also volumetrically smaller than the previous model, the iPhone 4S. On October 23, Apple CEO Tim Cook unveiled the new iPad Mini, fourth generation iPad with Retina display, new iMac, and the 13-inch MacBook Pro with Retina display. In 2013, WWDC 2013 was held from June 10 to 14, 2013, at Moscone West in San Francisco – the same venue as in previous years. Tickets went on sale at 10am PDT on April 25, 2013, selling out within 71 seconds (1 minute and 11 seconds). Apple also announced that it will award 150 free WWDC 2013 Student Scholarship tickets to those who want to attend in order to benefit from the conference's many workshops, with applications for a scholarship starting 9am PDT on April 29, 2013, and deadline slated for 5pm PDT on May 2, 2013. Winning applicants were notified by May 16, 2013, though Apple states that it won't reimburse winners for travel or hotel expenses. In the keynote, Apple unveiled a redesigned model of the Mac Pro, AirPort Time Capsule, and AirPort Extreme as well as updated models of the MacBook Air. Apple has also showcased OS X Mavericks, iOS 7, iWork for iCloud and a new music streaming service named iTunes Radio. Vampire Weekend performed at the Bash on June 13 at the Yerba Buena Gardens. This keynote was streamed live on June 10, 2013. Schiller then showed demos of Infinity Blade III to demonstrate the A7's processing power and the iPhone 5S camera using unretouched photographs. The release of iOS 7 on September 18, 2013, was also announced during the keynote. Apple held a second Fall event in 2013 under the name of "We still have a lot to cover". This event saw the unveiling of the iPad Air, the second-generation iPad mini with Retina display, and updates to the MacBook Pro line. Tim Cook also announced that OS X Mavericks would be available for free. At Moscone West, Apple presented the new version of OS X named Yosemite as well as the new version of iOS. The biggest news however was the completely new programming language for Mac and iOS called Swift. This keynote was streamed live on June 2, 2014. Presented on the "Wish we could say more" event was the most anticipated  iPhone 6 and iPhone 6 Plus as well as a new payment system called Apple Pay. Also, the Apple Watch, the company's first smartwatch, was introduced. The event took place at Flint Center, in Cupertino. Apple's “It’s been way too long” media event took place on October 16th, 2014. The company used this event to unveil the iPad Air 2, iPad mini 3, and an updated iMac with a 5K Retina Display. This keynote was streamed live on October 16, 2014. Apple Special Event 2015 ('Spring Forward') was an event by Apple that was broadcast live from Cupertino on Apple's website on March 9, 2015. It announced the release date and pricing for the anticipated Apple Watch, the MacBook's fourth redesign and iOS 8.2's same day release.. Apple also announced ResearchKit, a library designed to enable researchers to make study applications where participants can download them on their phones, electronic enroll & consent, and send survey and sensor data. Five launch studies were introduced, including My Heart Counts, which enrolled over 11,000 participants in a single day . This keynote was streamed live on June 8, 2015. The "Hey Siri, give us a hint" event was held at the 7,000-seat Bill Graham Civic Auditorium in San Francisco. Apple announced and previewed watchOS 2 with native apps; the long-anticipated Apple TV update - with App Store, Siri Remote and tvOS; iPhone 6S and iPhone 6S Plus with the Apple A9, 3D Touch, 12MP camera; iOS 9 update coming September 16; and iPad Mini 4 together with iPad Pro with 12.9" Retina display, optional keyboard/cover, and the Apple Pencil stylus. OneRepublic performed at the event. This keynote was streamed live on September 9, 2015. For the first time, Windows users were able to watch it live using Microsoft Edge, the native Windows 10 browser. Apple invited the press media for its event "Let us loop you in" on March 10, 2016 in their own theatre "Town Hall" (at 1 Infinite Loop). 9.7-inch iPad Pro, iPhone SE, CareKit and updates to Apple Watch, HealthKit, ResearchKit and tvOS were released. Apple invited the press media and developers for its event on June 13, 2016 at Moscone West to unveil new versions of iOS, watchOS, tvOS, and macOS, a revamped Apple Music design, and the Swift Playgrounds app - a learning tool for programming. This keynote was streamed live on June 13, 2016. Apple hosted a media event on September 7, 2016 with the invitation's tagline "See you on the 7th". iPhone 7 and iPhone 7 Plus were announced along with Apple's new wireless AirPods. iOS 10 was also released. Sia performed at the event. Apple hosted a media event on October 27, 2016 with the tagline "hello again". A new generation of MacBook Pro was announced. The 2017 Apple WWDC was held from 5–9 June 2017 in San Jose, California at its Convention Center. An all-new iPad Pro model was introduced with thinner bezels and a 10.5-inch screen size. It acquired many of the specs from the iPhone 7 and an A10X chip. The iPad Pro 12.9-inch was also refreshed with updated internals. iOS 11 was announced, with a developer beta released just after. Apple previewed many new Macs such as the MacBook, MacBook Pro, iMac, and an all-new iMac Pro. Apple's final announcement was HomePod. Apple hosted a media event on September 12, 2017, with the tagline "Let's meet at our place". The tagline was a reference to Apple holding its first-ever event at the newly completed Steve Jobs Theater in the Apple Park campus. At the event, Apple Watch Series 3, Apple TV 4K, iPhone 8 and 8 Plus, and iPhone X were announced. The release dates of iOS 11 and watchOS 4 were also announced. Apple hosted a media event on March 27 at the Lane Technical College Prep High School in Chicago. The 2018 iPad was announced at the education-focused event. WWDC 2018 was held from June 4–8 2018 at the San Jose Convention Center in California. The announcements at the event included iOS 12, macOS Mojave, watchOS 5, and updates to tvOS. Panic! at the Disco performed at the Bash at Discovery Meadow Park. Apple hosted a media event on September 12, 2018, with the tagline "Gather round". It was held at the Steve Jobs Theater in the Apple Park campus. The Apple Watch Series 4, the iPhone XS and iPhone XS Max, and the iPhone XR were announced at this event. Apple hosted a media event on October 30, 2018, with the tagline "There's more in the making." It was held at the Brooklyn Academy of Music in Brooklyn, New York City. The new MacBook Air 2018 model, Mac Mini 2018 model, and the 11-inch and 12.9-inch third generation iPad Pro were announced at this event. Apple hosted a media event on March 25, 2019, with the tagline "It's show time." It was held at the Steve Jobs Theater in the Apple Park campus. Apple News+, Apple Card, Apple Arcade and Apple TV+ were announced at this event. WWDC 2019 will be held from June 3–7 2019 at the San Jose Convention Center in California. ^ Grobart, Sam. "There Are Three Kinds of Apple Events". New York Times. ^ Lewis, Peter (January 12, 2007). "How Apple kept its iPhone secrets". CNN Money. Retrieved January 11, 2009. ^ "Apple – Hot News – Macworld 2007". Apple.com. Archived from the original on October 11, 2010. Retrieved October 7, 2011. ^ "AAPL surges past $100, target at $140". MacNN. April 26, 2007. Retrieved July 10, 2007. ^ Sadun, Erica (June 9, 2008). "TUAW Meta-Liveblog of WWDC 08 Keynote". Engadget. ^ "Apple Launches iPad" (Press release). Apple. January 27, 2010. Retrieved January 27, 2010. ^ Block, Ryan (January 9, 2007). "Live from Macworld 2007: Steve Jobs keynote]". Engadget. Retrieved February 1, 2007. ^ Grossman, Lev (January 12, 2007). "The Apple Of Your Ear". TIME. Retrieved February 1, 2007. ^ Ahmed, Azam (July 6, 2010). "Executive Pleads Guilty to Leaking Apple Secrets". The New York Times. ^ "iTunes - Apple Keynotes". Apple. ^ Hitesh Raj Bhagat, ET Bureau (February 26, 2011). "Apple iPad 2 to be unveiled on March 2". Bennett, Coleman & Co. Retrieved March 20, 2010. ^ Helft, Miguel (January 17, 2011). "Apple Says Steve Jobs Will Take a New Medical Leave". The New York Times. Retrieved January 17, 2011. ^ "IOS 4.3, GarageBand, and IMovie: What You Need to Know". PCWorld. Retrieved March 4, 2011. ^ Budmar, Patrick (February 28, 2012). "IPad 3: Local analysts all agree - it's coming". The Verge. Retrieved March 1, 2012. 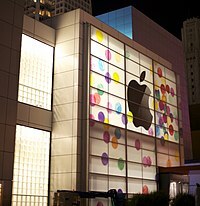 ^ "Apple prepares Yerba Buena Center for March 7 next-gen iPad unveiling". 9to5Mac. March 2, 2012. Retrieved March 11, 2012. ^ Lowensohn, Josh (February 28, 2012). "Apple sends out invites for March 7 iPad event". CNET. Retrieved March 1, 2012. ^ "Vancouver Sun". Vancouver Sun. Retrieved March 1, 2012. ^ "Apple TV". LA Times. Retrieved March 4, 2012. ^ Keizer, Gregg (February 29, 2012). "Looming iPad 3 launch sparks tablet trade-in stampede". The Verge. Retrieved March 1, 2012. ^ Owens, Jeremy (February 28, 2012). "Biz Break: iPad 3 announcement sends Apple to new high as Dow closes atop 13,000". Mercury News. Retrieved March 1, 2012. ^ Lowensohn, Josh (March 7, 2012). "Apple iPad live blog (Wednesday, March 7)". Cnet. Retrieved March 16, 2012. ^ Elgan, Mike (March 10, 2012). "Why Apple will crush Microsoft in the Post-PC era". Cult of Mac. Retrieved March 13, 2012. ^ a b Melanson, Donald (April 24, 2013). "Apple confirms WWDC 2013 will take place June 10th to 14th, tickets go on sale tomorrow". Engadget. Retrieved October 8, 2013. ^ a b Ion, Florence (April 24, 2013). "Apple to hand out 150 free WWDC tickets to budding young developers". Ars Technica. Retrieved April 24, 2013. ^ Rodriguez, Salvador (June 10, 2013). "Top features, products unveiled at Apple's WWDC 2013 Video chat". latimes.com. Retrieved July 8, 2013. ^ Svetlik, Joe (September 4, 2013). "Apple 10 September iPhone event is official, invites go out". CNET. Retrieved September 28, 2015. ^ "Apple iPhone 5S launch confirmed for September 10". TechRadar. Future plc. September 10, 2013. Retrieved September 10, 2013. ^ "The iPhone 5S: fingerprint sensor and improved camera, starts at $199 and coming September 20th". The Verge. September 10, 2013. Retrieved September 10, 2013. ^ Rogowsky, Mark (September 13, 2013). "One New iPhone Is Ready For Pre-Order; Yes, Just One". Forbes. Forbes, Inc. Retrieved September 13, 2013. ^ Paczkowski, John (September 13, 2013). "Apple's iPhone 5S, the A7 Chip, and That 64-Bit Question". All Things Digital. Dow Jones & Company. Retrieved September 16, 2013. ^ a b Cava, Marco Della (September 10, 2013). "Recap: Apple unveils iPhone 5S, 5C smartphones". USA Today. Gannett Company. Retrieved September 16, 2013. ^ Warren, Christina (October 22, 2013). "Apple iPad Air Event: Everything You Need to Know". Mashable. ^ "Apple - Apple Events - Special Event June 2014". apple.com. ^ "Apple officially holding event September 9th: 'wish we could say more'". The Verge. Vox Media. ^ Garun, Natt (October 16, 2014). "Everything Apple announced at its iPad and Mac event". Thenextweb. ^ "Get ready for an explosion of ResearchKit apps collecting health data". ^ "Apple Events - Special Event September 2015". apple.com. ^ Tibken, Shara (August 27, 2015). "Apple will host next iPhone launch Sept. 9". CNET. Retrieved September 14, 2015. ^ Grunin, Lori (September 9, 2015). "iPhone 6S, Apple TV 2015 and iPad Pro: All the cool stuff Apple just announced". CNET. Retrieved September 23, 2015. ^ Author, AppAdvice Staff. "What to expect at Apple's 'Let us loop you in' March 21 media event". AppAdvice. Retrieved January 2, 2017. ^ Kastrenakes, Jacob. "Apple iPhone 7 Event is Happening on September 7th". The Verge. Retrieved August 29, 2016. ^ "WATCH: Sia performs 'The Greatest' at iPhone7 launch". GMA News Online. Retrieved September 16, 2017. ^ "Apple's expected Mac event on October 27 is official: 'hello again'". 9to5Mac. Retrieved October 19, 2016. ^ Gartenberg, Chaim (August 31, 2017). "Apple's iPhone 8 event is happening on September 12th". The Verge. Retrieved August 31, 2017. ^ Gartenberg, Chaim (March 16, 2018). "Apple announces March 27th event focusing on education". The Verge. Retrieved March 17, 2018. ^ "The 5 biggest announcements from the Apple education event". The Verge. Retrieved March 27, 2018. ^ "Apple's Worldwide Developers Conference kicks off June 4 in San Jose" (Press release). Apple Inc. March 13, 2018. ^ "The 6 biggest highlights from Apple WWDC 2018". The Verge. Retrieved June 7, 2018. ^ Snell, Jason (October 18, 2018). "It's official: Apple event October 30, in Brooklyn!". Six Colors. Retrieved October 18, 2018. ^ Gartenberg, Chaim (March 11, 2019). "Apple confirms March 25th event, expected to announce new TV service". The Verge. Retrieved March 11, 2019. ^ Haselton, Todd (March 11, 2019). "Apple announces event for March 25th where streaming TV and subscription news services are expected". CNBC. Retrieved March 11, 2019. ^ Dieter Bohn (March 14, 2019). "Apple's WWDC 2019 will kick off on June 3rd". The Verge. ^ "Apple to host annual Worldwide Developers Conference June 3-7 in San Jose" (Press release). March 14, 2019. This page was last edited on 29 March 2019, at 01:31 (UTC).